Optimaaliseen säilytykseen. Ei homehdu, ei kuivu. Optimaalinen kosteusaste säilytysrasiassa tulisi aina olla 55%-62%. ''Integra Boost' Humidiccant by 'Desiccare, Inc.' uses patented technology that either releases moisture or absorbs moisture when needed and so maintains the relative humidity in a contained environment at 55% or even 62%. Which of them to choose depends on your own preference and the kind of flower. Both are safe because both are in the ideal range. Simply add boost pack to the storage container. Up to 1lb of flower, use 67g of 'Integra Boost'. The enclosed indicator shows immediately if the relative humidity is no longer optimal and the boost pack has to be replaced. And this without touching and possibly contaminating the flower. 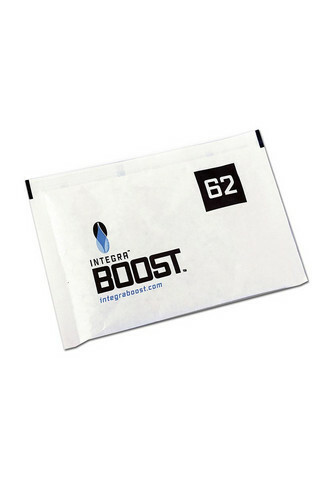 The boost pack contains no salts but a plant-based solution with glycerol and water. The packaging is printed with food grade colours so there is no harm to the flower. The boost pack is biodegradable, tear-resistant and splash-proof, too. It remains flexible and prevents the contents from leaking. With 'Integra Boost', flower remain fresh, effective and get agreeably mild in taste (because with successful fermentation the contained chlorophyll is removed) - in the easiest but safe way!"